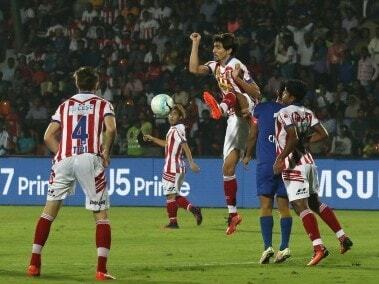 Mumbai: Atletico de Kolkata, reduced to ten men from the 43rd minute, reached the final of the Indian Super League on goal aggregate after playing out a hard-tackling, goalless draw with Mumbai City FC in the second leg semi-final at the Mumbai Football Arena on Tuesday. ATK had won the first leg encounter between the two teams 3-2 on December 10 and will now meet the winners of the second semi-final between Kerala Blasters and Delhi Dynamos in the summit clash at Kochi on 18 December. 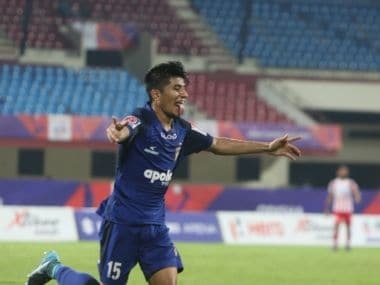 Mumbai gave the captaincy honours to star India striker Sunil Chhetri in the absence of their marquee player Diego Forlan who was suspended after picking up two yellows in the first leg held in ATK's home venue, but the star forward was found wanting in the crucial game. ATK also made forays into the rival area but their first real chance came when Javier Lara sent Abinash Ruidas up on a run down the left flank for the latter to square the ball to substitute Lalrindika Ralte who took the shot on the bounce which was blocked before it could spell danger to the Mumbai goal at the top of the box by the home team's L Ralte. All these frustrations turned into ill-temper and the result was Lalthlamuana's double booking in the 34th and 43rd minutes leading to his ejection from the field. Just prior to his second booking, Chhetri's header off a corner was foiled in the nick of time by Lara. Tempers got frayed towards the end of the half and Ruidas was booked for arguing with referee, A Rowan. In a clear move to shore up their defense after being reduced to ten men, ATK substituted Ruidas with Keagan Pereira at the beginning of the second half. They also packed their area with players and Mumbai, despite being egged on by their supporters in the packed Andheri stadium, found it difficult to pierce the visitors' fort and their moves did not have the co-ordination of the first half. Mumbai also made substitutions from the beginning of the second half, replacing Krisztian Vadocz and Sehnaj Singh with Thiago Santos Cunha and Jackiechand Singh. ATK found two chances to put the issue beyond Mumbai but Lara, in the 60th minute, and Stephen Pearson, fifteen minutes later, both were off target from close range efforts. Mumbai missed scoring towards the fag end of the game when Goian and Jackiechand were both off target following a wonderful minus pass from the left by Norde and then Goian's right-footed volley could not beat Majumder.